Dust off your favorite hiking shoes and grab your water bottle. The 22nd annual Connecticut Trails Day Weekend celebration is almost here! The 2014 festivities will take place on Saturday and Sunday, June 7 and 8, as part of National Trails Day. Invite a friend to join in the fun and take part in one of the 258 trail events, featured in this year’s CT Trails Day Weekend Booklet. There will be outdoor activities for everyone — including hiking, biking, horseback riding, running, trail maintenance, kayaking, educational walks, bird watching, letterboxing, and more. These events are guided by knowledgeable volunteers from local hiking clubs, parks and recreation departments, state agencies, conservation organizations, historic groups, education programs, and land trusts. Don’t miss out on this fun-filled weekend, which will provide many opportunities to discover new places and experience the outdoors with family, friends, and neighbors. 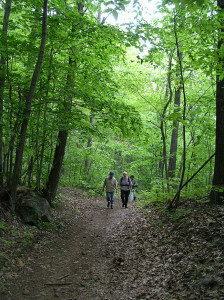 In celebration of Connecticut Trails Day, join the Branford Land Trust for a walk along Pisgah Brook and on Saltonstall Ridge, Saturday, June 7, from 9:30am-11:30am. We’ll travel 3.5 miles, led by Bill Horne. Wear good walking shoes and bring water to stay hydrated. Meet at the end of Laurel Hill Rd., a right turn off Brushy Plain Rd. about 1.2 miles north of I-95 Exit 54. For details, contact Bill (203-488-6146, email). • CLICK HERE to download the CT Trails Day Weekend Booklet now!